It may have started in 3rd grade—this need for transformation. Unlike most kids who would say, if asked, that their favorite holiday was Christmas, mine was Halloween. Whether dressing as a ghost, a witch, a gypsy, or a bum the idea of becoming someone else for even a short time held and continues to hold a fascination for me. Junior High brought other attempts to change - experimenting with make-up, trying to adopt an exotic accent, changing my name from Judy to Judi. High school was a time to learn more about who I was, but mostly to try not to stand out from the crowd. Then, at university all hell broke loose. It was the early 70’s at a very liberal university in Colorado. My liberation that year consisted of wearing jeans to class, letting my hair grow long and straight, shedding my make-up, and trying on radical, new ideas. But then as I got older, I lost my edge. I became a woman who is personable, somewhat outgoing, active in my church and community, but most often enjoys just staying at home, reading or doing art projects. I suppose this places me in the “Boring, but nice” demographic. I didn’t even think about transformation as I packed my bags for my trip to Kenya. I work for a non-profit, Waterlines, located in Santa Fe, New Mexico, that funds clean drinking water projects in developing countries. One of the great benefits of this work has been the opportunity to visit projects that our donors have sponsored. 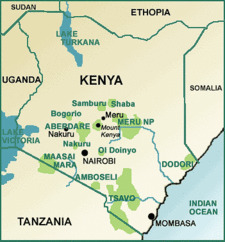 The two week period was spent in rural areas of Kenya, four hours from Nairobi. Most of the projects we visited were schools where Waterlines, in partnership with the local communities, has funded rain collection tanks. These large tanks (33,000- 50,000 liters) are filled with rain water collected through gutters from the roof of a classroom during one of the two rainy seasons Kenya has each year. Without these tanks, children are required to bring water from home or spend class time going to a river several kilometers away to haul back polluted water for drinking and cooking. Obviously neither is a good solution to the drinking water problem. For me, a former public school teacher, visiting schools is a holiday! It is both inspiring to see how much teachers do with so little in resources, and sad to see how the students struggle to pay fees for secondary school and learn without adequate books, lab equipment, or even pencils and paper. I’m not exactly sure why this transformation happened in Kenya. I think when I stepped out of the airport and remembered the smell of the smoke from the cooking fires all over Nairobi, I felt different. When visiting schools and springs,I embraced, both literally and figuratively, the welcoming women singing to us as we walked toward the schools. I was the person who could confidently stand in front of several hundred men, women, and children and echo President Obama’s words about the mutual responsibility we, as Americans, share with Africans in dealing with some of the problems of the world. I could imitate the shuffling dance that was required when a guest is led to receive a gift from the parents of the school. I could clap (although as my daughter reminded me, not in time) during the dance/song performances of the children as they sang invented songs, welcoming us, and thanking us for the gift of clean water. The word “solidarity” comes to mind. For just a short period of time I was living in the moment, experiencing their lives, at one with the people surrounding me. On returning home this time I began to think, with the help of a friend, about why I was a different person in Kenya from the woman I am at home. I was fortunate in having my daughter, a 28 year old teacher, with me on the trip. Had I been showing off for her? Was the fact that I had planned the whole trip a confidence-builder? After three trips to Africa, did I simply feel more at home there? Was it that I had nothing to lose knowing that I probably would not see these same people again? Had it been my reaction to the warm hospitality of the Kenyan people? I think it was all of these things, but something more. All my life I have gone through stages of transformation. But in Kenya, I became more open to new people and experiences. Less inhibited. Less fearful of what people might think of me. Perhaps everything else in my life was a preparation for this experience in Kenya. I am so grateful for this opportunity to experience the warm-heartedness and hospitality of the Kenyans I met. Responding to them opened by heart in ways that were new and encouraged me to be my best self. The challenge now is to be that same person in Kansas City, Portland, Baja, or yes, even at home. Judy Crawford is a retired elementary school teacher who loved teaching. She has a supportive husband, two successful adult children, and a beautiful home in the mountains outside Santa Fe, NM. Her work for Waterlines has been one of the joys of her life. She is using her 60th year on this earth to do more of what she loves.